Remove the rear pillar finisher. Refer to INT-29, "REAR PILLAR FINISHER : Removal and Installation". 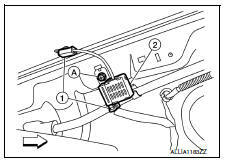 Disconnect the harness connectors (1), remove the condenser bolt (A) and the condenser (2).